Learn how the Holy Spirit equips and empowers you to overcome. Get the facts on transitioning into the New Testament apostolic model of ministry. Find your place in the exciting restoration of all things. Learn how to inspire others. Develop your spiritual authority to govern in all things. Discover the apostolic model that is results oriented. Discover your need for a spiritual father. Get equipped to fulfill your spiritual assignment. Develop a reforming spirit that turns the world upside down. Learn the five stages of apostolic ministry. Overcome the murdering spirit of religion. Have fun learning the dominion lifestyle of a spiritual warrior. Learn how to be strong in the Lord and overcome fear. Discover your place of spiritual jurisdiction and authority. Learn how to live victoriously in different spiritual climates and seasons. Develop apostolic grit as you learn to hear from God and be led by the Holy Spirit. Have your questions answered by instructors and moderators through the online forum. Download thirty-four apostolic class lessons, audio teachings, and reading assignments in digital format to keep in your personal library. Receive an Apostolic Equipping Institute Apostolic Ministry Certificate suitable for framing after completing this course. 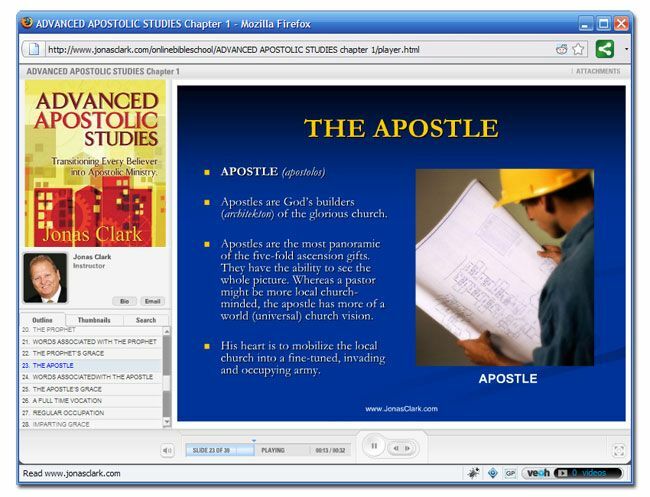 Advanced Apostolic Studies online apostolic ministry training course includes thirty-four apostolic class lessons, audio teachings and reading assignments to help you catch the spirit of the module with online quizzes that monitor your progress and understanding of each lesson.